It wasn’t until the 1950’s when Ruth presented an idea to Mattel about a doll she’d like them to produce. The idea came to her when she watched her daughter play with her paper dolls. Mattel wasn’t interested in her idea. In 1956, Ruth made a trip to Europe. While shopping in Lucerne Switzerland, she spotted the German made Bild Lilli doll. It was just the kind of doll she wanted to produce. Ruth bought three of the dolls and gave one to her daughter Barbara to play with. She took the other two back to Mattel to show them her idea and this time liked it. During 1957 Mattel began designing and testing the doll. In 1958 she was patented and then finally produced. Barbie’s first debut was at the International American Toy Fair in New York City on March 9th, 1959. 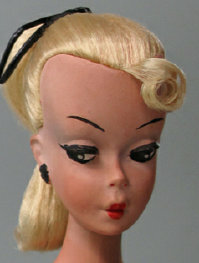 Mattel eventually purchased the rights to the Bid Lili doll and in 1964 stopped producing it. The 1960's were booming for Mattel and life was good in the toy industry! So good, that by 1965 Mattel was the number one toy producer in the United States. It wasn't until 1970 when problems started arising. There was a devastating fire which destroyed Mattel’s Mexico plant. July 1971 brought the crippling 130 day dockworkers strike, which stopped shipments from coming into the United States from Mattel’s plant in Asia. By 1973 Mattel’s stock had fallen, and there were understandable concerns when it was discovered that Mattel had released false reports over a two year period, uncovering a thirty-two million dollar loss. This eventually prompted an investigation by the Security and Exchange Commission. By 1975 the investigation was complete, and Ruth Handler, the original creator of Barbie and original owner of Mattel (with her husband Elliot), were forced to resign and leave the company. Seymour Rosenberg, who was the V.P. and C.F.O. of Mattel, was fired. Ruth and Seymour pleaded no contest to the S.E.C. charges, and their sentences (which had included jail time) were reduced to fines and five hundred hours each of community service work every year for five consecutive years. Mattel was looking for new ways to return to profitability, but by 1973 the quality of the Barbie doll was deteriorating. No longer did we see “real eyelashes”, and they began using more economical vinyl to make some of the dolls. It wasn't until 1976 that Mattel added "real eyelashes" back to one of their Barbies. She could be found only as a department store exclusive; #9599 "Beautiful Bride Barbie" and what a beauty! 1980 was a new beginning for collectors. Three women got together (Helen Gaydarik, Ruth Cronk, and Fay Jordaens) and organized the very first National Barbie Doll convention which was held in New York City. About one hundred people attended. The second convention wasn't until 1982 in Troy, Michigan. About five hundred attended. 1982 marked the beginning of this becoming an annual event, which it still is today. Doll clubs from around the country organize these conventions, which include a different theme and location.